Subtalar dislocation refers to the simultaneous dislocation of the distal articulations of the talus at the talocalcaneal and talonavicular joints. Closed reduction and immobilization remains the treatment of choice. However, if closed reduction is unsuccessful in some patients, open reduction is required. Open reduction can be associated with higher energy subtalar dislocations. A variety of bone and soft tissue structures may become entrapped, resulting in obstruction of closed reduction. This is a unique case report which presents an unsuccessful closed reduction of an open lateral subtalar dislocation that required open reduction. 1 Professor, Dept. of Orthopaedics, J.J.M. Medical College, Davangere, Karnataka State, India. 2 Post graduate student, Dept. of Orthopaedics, J.J.M. Medical College, Davangere, Karnataka State, India. Subtalar dislocation is an uncommon injury accounting for 1-2% of all joint dislocations . It involves the disruption of the talocalcaneal and talonavicular joints, while the calcaneocuboid joint remains intact [2,3,4,5]. Medial dislocations comprise up to 85% of subtalar dislocations, whereas lateral subtalar dislocations are less frequent occurring in 15% to 20% of dislocations. In medial subtalar dislocation, the head of the talus is found laterally and the rest of the foot is dislocated medially. However, in a lateral subtalar dislocation, the talus can remain fixed while the remaining structures of the foot are dislocated laterally along the talus. Subtalar dislocations present with an impressive amount of deformity. The medial dislocation has been referred to as an acquired clubfoot, while the lateral dislocation has previously been described as an acquired flatfoot . Many of these injuries are open as well, particularly when associated with a high-energy mechanism. Up to 40% of subtalar dislocations may present with an open wound . We present a unique case report of a 30 year old male patient presenting with an open lateral subtalar dislocation following a fall from a height, with posterior tibialis tendon interposition posing difficulty in closed reduction. A 30 year old male patient presented with a history of a fall from a height as he climbed a coconut tree. Initial examination revealed diffuse swelling of the left foot with a laceration of 4 cm over the medial aspect of the left foot, extending distally from below the medial malleolus. The left foot was fixed in a pronated position. Distal perfusion and neurological status of both lower limbs and bladder functions were intact. Radiographs revealed dislocation of the left talocalcaneal and talonavicular joints, without any regional bony injury (Figure 1, 2, 3). Initially, closed reduction was attempted which was unsuccessful. The patient was taken to the operating room for open reduction. The talus was explored through the medial wound, and the tendon of tibialis posterior was found to be interposed between the talus and calcaneum. 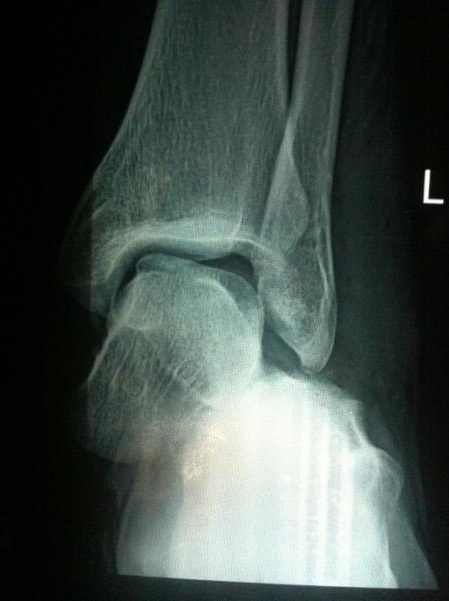 Figure 1 Preoperative lateral view, demonstrating subtalar joint dislocation without fracture. 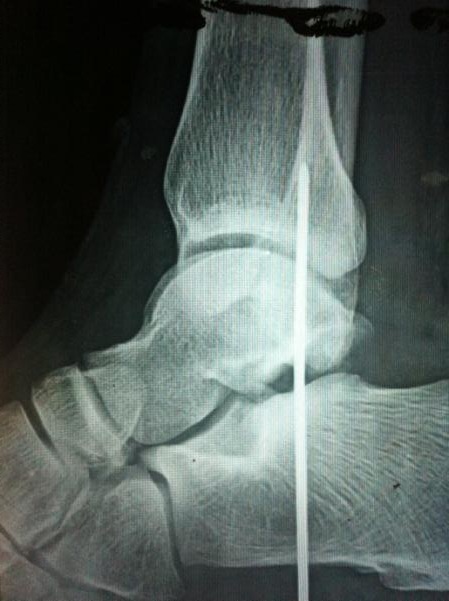 Figure 2 Preoperative ankle AP view, demonstrating subtalar joint dislocation without fracture. 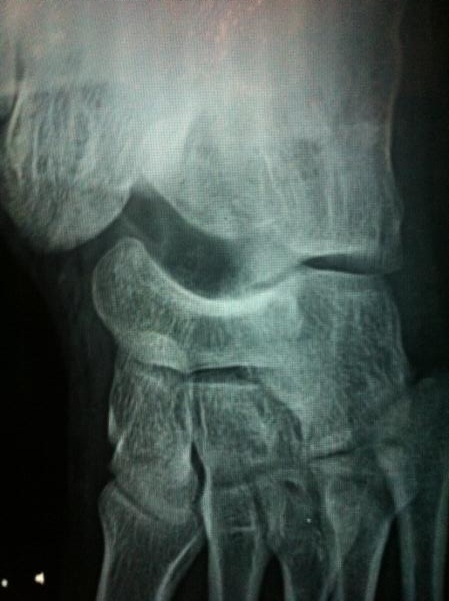 Figure 3 Preoperative oblique foot view, demonstrating talonavicular joint dislocation without fracture. Figure 4 Postoperative lateral view, demonstrating Kirschner wire fixation. The posterior tibial tendon was retracted, and the talus was levered into a more anatomical position with reduction achieved. Adequate reduction was confirmed using a computer assisted radio monitor (c-arm). A thick Kirschner wire was inserted from the calcaneum into the talus to hold the reduction (Figure 4). A below knee splint was applied after placing a sterile dressing on the operative site. Clinical reviews of subtalar dislocations are relatively infrequent and generally limited to a small numbers of patients. These injuries most commonly occur in young adult males, although Bibbo et al noted 36% of subtalar dislocations in their case series of 25 patients occurred in patients over 40 years of age . The direction of subtalar dislocation has important effects with respect to management and outcome. The method of reduction is different for each type of injury. Lateral subtalar dislocations are often associated with a higher energy mechanism and a worse long-term prognosis compared to medial subtalar dislocations. Subtalar dislocations can result from either high-energy or low-energy mechanisms. The distinction is important because outcome has been correlated with the severity of the initial injury. In the case series presented by Bibbo et al, high-energy mechanisms such as motor vehicle trauma and falls from a height accounted for 68% of subtalar dislocations . Open subtalar dislocations and lateral subtalar dislocations are more common with a high-energy mechanism. Medial injuries are more common than lateral dislocations, suggesting that the forces required to produce it are less than those required to produce a lateral dislocation. High-energy subtalar dislocations may be associated with other injuries, either regional or involving other body systems. Bibbo et al described associated foot and ankle injuries in 88% of patients with subtalar dislocations. In their series of subtalar dislocations from a major level 1 trauma center, other musculoskeletal injuries occurred in 48% of patients and 12% of patients had injuries to the head, abdomen, or chest . Regional fractures include talus, ankle, calcaneus, navicular, cuboid, cuneiform, and metatarsal fractures . Osteochondral shearing injuries to the articular surface of the talus, the calcaneus, or the navicular are common. These injuries occur in up to 45% of patients, and are difficult to detect on plain radiographs [3,10,11]. Injuries remote from the foot and ankle may occur as well. All subtalar dislocations require a timely reduction. In most cases, closed reduction can be accomplished. Often times, the injury presents with skin tenting requiring a prompt reduction to reduce the possibility of skin necrosis. Open peritalar dislocations require a formal irrigation and debridement in addition to the reduction followed by wound closure . In approximately 10% of medial subtalar dislocations and 15% to 20% of lateral dislocations, closed reduction cannot be achieved [13,14]. Soft tissue interposition and bony blocks have been identified as factors preventing closed reduction. With medial dislocations, the talar head can become trapped by the capsule of the talonavicular joint, the extensor retinaculum, the extensor tendons, or the extensor digitorum brevis muscle [13,14]. With a lateral dislocation, the posterior tibial tendon may become firmly entrapped and present as a barrier to closed reduction requiring open reduction [14,15]. In our case presentation, the patient had sustained a high-energy trauma leading to a lateral subtalar dislocation. Following the initial failed closed reduction attempt, open reduction was required. We identified the tibialis posterior tendon obstructing the possible closed reduction. This case report shows successful open reduction of a lateral subtalar dislocation with Kirschner wire fixation. Straus DC. Subtalar dislocation of the foot. Am J Surg 1935;30:427-34. Sanders DW. Fractures of the talus. In: Bucholz RW, Heckman JD, Court-Brown C, editors. Rockwood and Green’s Fractures in Adults. Vol 1. 6th ed. Philadelphia: Lippincott Williams & Wilkins; 2006. 2249-2292. 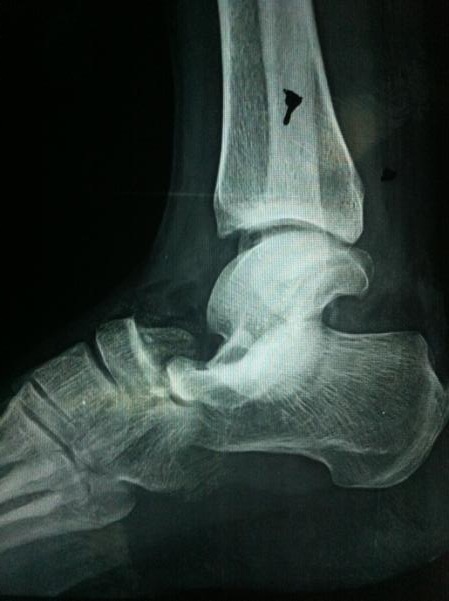 This entry was posted in Uncategorized and tagged dislocation, open reduction, Subtalar joint. Bookmark the permalink.